Welcome to Larkfield Children’s Centre. We want you to feel welcome and hope you find the Centre a safe and happy place to be, where everyone is valued, respected and included. Please come in and get to know us. We work hard to promote effective partnership with parents and want you to be involved in your child’s learning. The children are encouraged to develop a positive attitude to learning, making choices and gaining the confidence to tackle challenges, but most of all to have fun while they play and learn. If you have any concerns or questions regarding your child’s learning, development or progress please do not hesitate to speak to me or any member of the staff team. We look forward to getting to know you and your child and hope you enjoy your experience at Larkfield Children’s Centre. We have introduced ‘stay & play’ days, which are informal sessions to allow you the opportunity to see what sort of experiences your child participates in at nursery. It will also give you the chance to take part in play experiences, some of which can be quite messy so be prepared! No pressure, you can stay for all of the session or just for a short while. If you would like to attend, please speak to a member of staff or add your name to the sheet outside the playrooms. The sessions will take place every Wednesday. We have received our first Green flag award!! 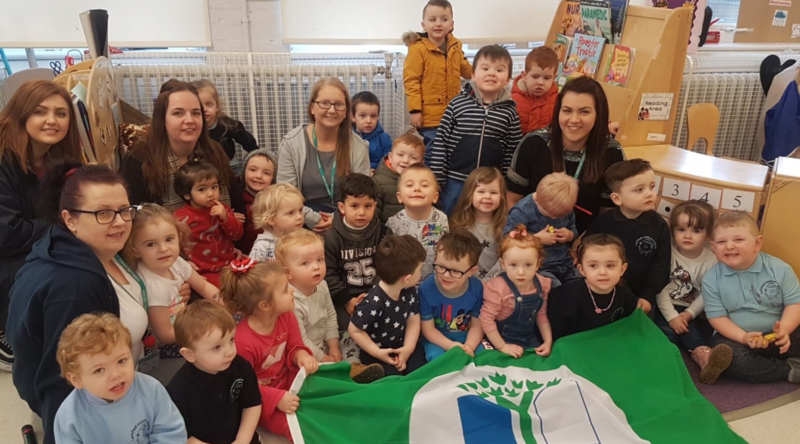 Well done to all children, parents and staff for working towards successfully receiving our first green flag award from eco schools – keep Scotland beautiful! We now have a recycle bin outside the 3-5 playroom to recycle your household batteries. Please feel free to use this.